Hypertext Transfer Protocol (HTTP) has been around since 1991, and we haven’t seen a major update since 1999, when HTTP/1.1 was released. During this time a lot of performance best practices have been passed around the web to try and circumvent some of the shortcomings in HTTP/1.1. Sites such as Pingdom and GTmetrix are the de facto when it comes to measuring a site’s performance and for the most part they’re excellent tools. However, some of their recommendations aren’t relevant in the era of HTTP/2. Let’s take a look at what’s new in HTTP/2 and what that means for performance best practices going into 2017. This is arguably the flagship feature of HTTP/2, which fixes one of the biggest problems with HTTP/1.1, namely head-of-line blocking. In layman’s terms it means that only one request can be outstanding on a connection at a time, resulting in latency. This is because the next request is only issued once the response to the current request has been received, resulting in a “queue” of assets to be downloaded from the server. In an attempt to circumvent this issue a browser may open multiple TCP connections, allowing assets to be downloaded in parallel. However, browsers have a limit on the number of TCP connections that can be open simultaneously to a single host. This can range from 2-8 depending on the browser, so as not to flood network traffic. Opening a new TCP connection in itself can cause latency, especially when HTTPS is involved, due to negotiating a TLS session. Multiplexing fixes these issues by allowing multiple requests and responses to be handled by a single TCP connection at the same time. This allows the browser to begin downloading assets as it finds them in the DOM, without having to wait for a TCP connection to become available. Latency is also reduced, because the handshake process when establishing a new TCP connection only has to happen once per host. But, headers can also contain information such as cookies or referrers, which quickly increase their size. On sites with large amounts of requests this can quickly add up and increase the time on the wire before the client even begins handling the response. Most assets will contain the same response and request headers, therefore it’s inefficient to re-send them on every request. HTTP/2 uses an index table, which stores the headers received from the first request it handles. Subsequent requests then only have to send the index of the duplicate header, opposed to the full textual value. Unique headers or headers that have changed are sent as normal. Header compression can decrease the header sizes by an average of 30%, according to tests carried out by KeyCDN, which isn’t something to be sniffed at! Traditionally, when a browser requests a page, the server sends the HTML in the response, and then needs to wait for the browser to parse the HTML and issue requests for all of the assets before it can start sending the CSS, JS, etc. Server push allows this round trip to be circumvented by allowing the server to send any assets to the client it thinks it may need. For example, when a page is requested it’s probably going to need a stylesheet. Unlike the other new features in HTTP/2, server push requires additional thought and configuration before it can be implemented and is an ongoing area of experimentation. If not configured correctly it can harm performance, so it’s probably better left alone for the time being. In order to use HTTP/2 you must also enable HTTPS. Although the HTTP/2 specification doesn’t stipulate that HTTPS is required, no browser is yet to implement it without requiring encryption. This may seem counter intuitive as I mentioned earlier that opening HTTPS connections can be slower than regular HTTP. In many cases due to multiplexing, the number of TLS sessions that need to be established is significantly reduced. 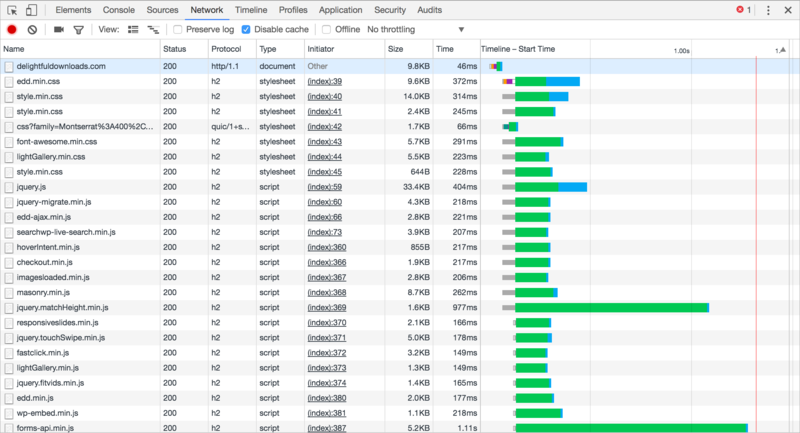 HTTP vs HTTPS Test compares the load times of HTTP/1.1 and HTTP/2. In this test HTTP/2 was 85% quicker than HTTP/1.1! 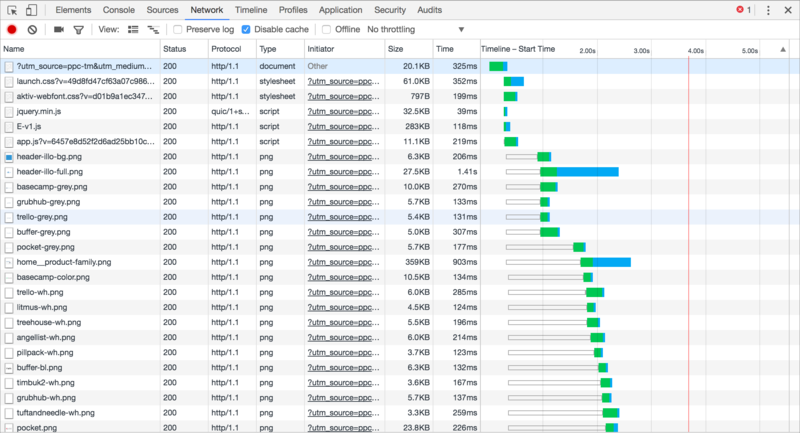 As previously demonstrated, enabling HTTP/2 alone can have a significant impact on your site’s performance, but there are additional best practices to ensure optimal load times. Regardless of which HTTP version is used to fetch assets from the server it’s still a slow and sometimes expensive process. Each asset should have a Cache-Control header, which specifies how long the browser can cache the file locally. Once a file is cached, subsequent visits to your site will be quicker because the browser doesn’t have to download those assets again. For assets that don’t frequently change they should have a cache time of 1 year. Static files such as CSS and JS should be compressed by the server before sending them to the browser. This can reduce file sizes by up to 90%, which can significantly reduce the time it takes to download each asset. Reducing the number of hosts will not only reduce DNS lookups, but multiplexing in HTTP/2 will be used to its full potential. HTTP 301 or 302 redirects are sometimes inevitable due to content moving. However, every effort should be made to keep them to a minimum and you should avoid redirect chains at all costs. Every redirect will incur an additional round trip from the browser to the server and increase latency. Although using a CDN causes an extra DNS lookup and requires an additional TCP connection, the speed improvements far outweigh the negatives. Serving assets from geographic locations closer to your users will dramatically decrease the download time of assets. You should also remember to enable HTTP/2 support via your CDN control panel. Not all providers have it enabled by default. The majority of best practices for HTTP/1.1 will continue to be beneficial for HTTP/2, however, there are a few that may actually harm performance. Let’s look at each of these practices separately. The concatenated file would often contain components not required by the current page. For example, your blog page might load components that are only used on your checkout pages. If a single component changed then the entire concatenated file would need to be invalidated from the browser cache. Similar to concatenation, it’s no longer necessary to bundle up your site’s images into a single sprite sheet. The exception to this rule is when using SVG files. A single SVG file may yield better compression results, but this is something you will need to test on a case by case basis. One method of reducing HTTP requests in HTTP/1.1 was to inline assets. This was especially common for images which could be converted into a data URI and loaded by the browser without making an additional request to the server. The problem with this technique is that the asset can’t be cached by the browser and will therefore be downloaded (as part of the page source) on every request. This is an anti-practice because multiplexing can no longer be used to it’s full potential and it increases the number of DNS lookups. It’s been an exciting couple of years for the web, with the widespread adoption of HTTP/2 and Let’s Encrypt. Not only is the web becoming faster and more secure, but it’s easier than ever for developers and site owners to implement performance and security best practices. There are arguably no drawbacks to making the switch to HTTP/2. All major browsers support version 2 of the protocol and those that don’t will fallback to HTTP/1.1. Sites with a large amount of external assets or those already running on HTTPS will see the biggest increase in performance, but at the very least you will no longer have to worry about concatenation, inlining or domain sharding. Have you made the switch to HTTP/2? Let us know in the comments below. This entry was tagged Performance, Hosting, Cache, HTTPS, HTTP/2, CDN, Best Practice.